Whilst shopping for post cards in Udaipur, the city famous for its lakes, I found one shop that was also selling beautiful hand made books and paper and small paintings in typical Rajasthan style. The man behind the counter was smartly dressed in pressed checked shirt and trousers, he had a diamond stud in his left ear and he was very cheerful, after I had paid for a couple of the hand made books and I was about to leave his shop I mentioned to him that he obviously took great care of his personal grooming. He smiled at me and nodded his head to the side, in the way only an Indian man can do. I told him that I wished that I had my camera with me so I could take his portrait but unfortunately I had left it in my room at my guest house. He said “no problem, go and get it, I will still be here”. I went back to my guest house to drop off the books and also to collect my camera and by the time I returned to his shop he was looking even more immaculate than before. 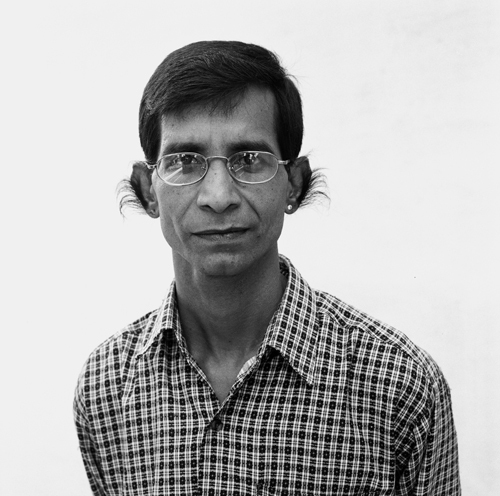 I asked him how he kept his ear hair in this style; he told me proudly that he used a tooth brush. Great post Jason. I love taking portraits and think that maybe I should take a similar approach to yourself. Fantastic when you meet people such as this. Great background story to go with the image as well. Love this Jason, I see you got over your writers block. Yes I got over it but it lasted a couple of weeks!